On 19 April 2011, His Majesty the King of Bahrain wrote an article in The Washington Times in which he discussed the recent political, economic and security situation in the country. Some parts of the article are directly related to the future of the political and human rights situation in Bahrain. The BHRM is publishing His Majesty’s article so that the readers can have a comprehensive picture of the developments taking place in the country. The winds of change that are sweeping the region hit the shores of Bahrain. Demands for well-paying jobs, transparency in economic affairs and access to better social services were received with good will. There is no doubt that grievances about civil and political rights for all Bahrainis are legitimate. In response, we offered an unconditional dialogue with the opposition so as to maintain the stability of our country and address the demands for reform. Unfortunately, the legitimate demands of the opposition were hijacked by extremist elements with ties to foreign governments in the region. It became very clear that the stability, safety and economic viability of our country were being threatened. We took immediate action to stabilize the situation and at the same time welcomed the entry of Gulf Cooperation Council (GCC) troops, whose task was not to suppress the protesters - as some of our neighbours have alleged - but to protect the essential and crucial facilities and installations in Bahrain. At that moment, we had to make a decision not just for the stability and safety of our countrymen but also for the region. Bahrain lies at the epicenter of Gulf security and any violent upheaval in Bahrain would have enormous geopolitical consequences. Global economic stability depends on the uninterrupted export of crude oil from the Gulf to markets around the world - a job that historically has been assigned to the U.S. Fifth Fleet. Seventy percent of the world’s remaining oil reserves are in the Gulf and more than 30 percent of the oil from the region flows through the territorial waters of Bahrain. The Gulf countries, for their part, shoulder the responsibility to protect these reserves and ensure the safety and security of the oil tankers and the oil pipelines that carry them to the world. These pipelines extend thousands of kilometers throughout the Arabian Peninsula . Today we are trying very hard to improve the process of reform and rectify those problems that have arisen along the way. Sectarian divide has created a schism in our society that is a major challenge. As monarch of all Bahrainis, it pains me to see many harmed by the actions of a few. And yet I am optimistic and have faith in our people. We all realize that now is the time to strike a balance between stability and gradual reform, always adhering to the universal values of human rights, free expression and religious tolerance. I am confident that we can strike this balance in cooperation with our long-time friend and ally, the United States, producing an outcome that will preserve the aspirations of our young democracy in transition. We invite American companies looking to raise capital to list on the Bahrain Stock Exchange (BSE). The region has a liquidity oversupply approximating $1 trillion and this pool of capital can be tapped into by creative American companies. The next Facebook may very well get funded on the BSE. 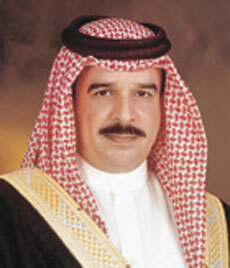 An important element of job creation is the enactment of a GCC “Marshal Plan” for Bahrain. Our neighbours - Qatar, Saudi Arabia, Kuwait and the United Arab Emirates - can take a lead role in funding infrastructure and energy projects. For example, Qatar can fast-track the construction of the much touted Bahrain-Qatar causeway. This will allow for immediate employment of hundreds of Bahrainis. An integral element of any support for Bahrain should be a scholarship program for Bahrainis from all walks of life to obtain their undergraduate and graduate degrees in the United States. Education is the best investment our GCC neighbours can make in the future of Bahrain. The rationale is simple: The prerequisite to better paying jobs is a world-class education. This investment will allow our citizens not only the opportunity to bring their skills back to Bahrain and put it to productive use, but also allow them to gain meaningful employment within the GCC. Last but not least, we would welcome a joint U.S.-GCC effort to fund and implement a training program in the United States for new recruits to the Bahraini police force and army. When I was a student at the Army War College in Ft. Leavenworth, Kan., it was very clear to me that the American experience was a model well worth emulating. The events that have unfolded since February offer new opportunities for both of our countries.